Venom, the very word elicits respect, scorn and even laughter in the metal community. 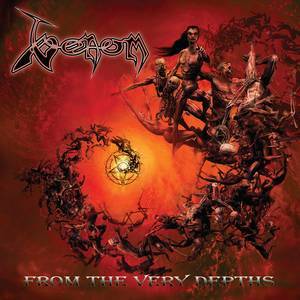 Venom is the band that helped kick start extreme metal in the early 80s. You can mock the band’s image and musicianship all you want, but this is the group that coined the term black metal with its seminal 1982 record of the same name. Now, frontman and bassist Cronos and the boys are back with the band’s 14th release, From the Very Depths. The hellish mid-paced stomp of the title track encompasses what the band is known and loved (or despised) for. That is, of course, lyrics praising Satan, underrated guitar leads and thick riffs. “The Death of Rock n’ Roll” is a punk infused track whose title is more tongue in cheek than anything. Rock ‘n’ roll cannot die when bands like Venom keep on rocking. Satan’s house band gets psychedelic on “Smoke,” with Middle Eastern influenced guitars and pounding drums. It slams like a colossus through a building. The track “Long Haired Punks” is everything one would expect based on the title. Venom were certainly a band of long haired punks as the group blended punk and metal in the 80s. This track seamlessly blends both genres as Cronos gleefully pays tribute to his band. The lyrics define the band perfectly as “dogs of mayhem who don’t give a damn.” The straight ahead attitude of “Crucified” is both harsh and accessible. This is a track that could enjoy airplay on the Internet or satellite radio. The production of early Venom records is as infamous as the band’s image. It was lo-fi and tinny. Metal fans would deride the production in comparison to Iron Maiden and Judas Priest records. However, this lo-fi sound would become a convention of black metal. But on this record, Venom gets with the times as the album is cleanly produced. The sound is as big as the band’s image, giving the tracks an extra punch. From the Very Depths is a Venom record. Therefore, people will either pick it up or avoid it like the plague. That said, it is a good record, with the only drawback is it drags on at times. Fourteen tracks is a bit long for a Venom record and it would be just as strong or stronger with 10 tracks. Still, the trio should be commended for stellar musicianship and good songs. From the Very Depths is a solid cut.